The Francisco Park Conservancy team has been hard at work these past few months, and we are eager to provide you with an update on the future park. As you may recall, the Francisco Park Conservancy and the SF Recreation and Park Department co-hosted a series of community meetings starting in September 2016 to solicit feedback on potential features and a conceptual design of the park. Over the past several years, we have held smaller discussions with organizations and community leaders including Friends of Joe DiMaggio Playground, the SF Police Department, the SF Arts Commission, the Parks and Recreation Open Space Committee (PROSAC), as well as the principals of Galileo Academy, Francisco Middle School, and Yick Wo Elementary School. To ensure we reach as many members of the community as possible, we also launched an online design survey which has received more than 700 responses so far. Thanks to all those who participated! After collecting all of this feedback from the public, we put our design team to work. Now, with your help, FPC is ready to share an updated park plan that incorporates the hundreds of public comments we have collected. Our goal is, and always was, to create a park accessible and useful for all San Franciscans, and we are confident the updated design accomplishes that goal. Please join us at our next community meeting, where we will share the updated park design and hear from the Francisco Park Conservancy, the SF Recreation & Park Department, the SF Arts Commission, and several architectural and engineering experts on our design team. For information about our past community meetings, click here. To submit your feedback through our online design survey, click here. Many of you have expressed a desire to participate in more detailed discussions surrounding the design of the children’s playground. We welcome your input! 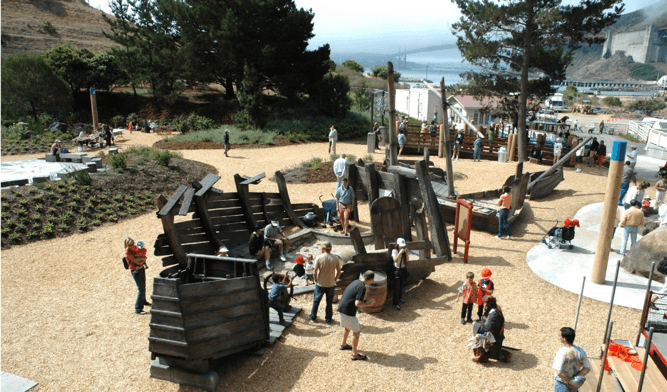 We have planned a visit on Wednesday, April 19 to Scientific Art Studio, the firm that designed the Elinor Friend Playground at the San Francisco Zoo and outdoor play structures at the Bay Area Discovery Museum at Fort Baker. If you would like to take part in this information-gathering visit, please contact us at info@franciscopark.org. If you are unable to attend but would like to be involved in the playground design, please contact us and we will be sure to include you in future visits and discussions. We welcome your feedback! As many of you noticed, we invited some friends to help tend to the open space! 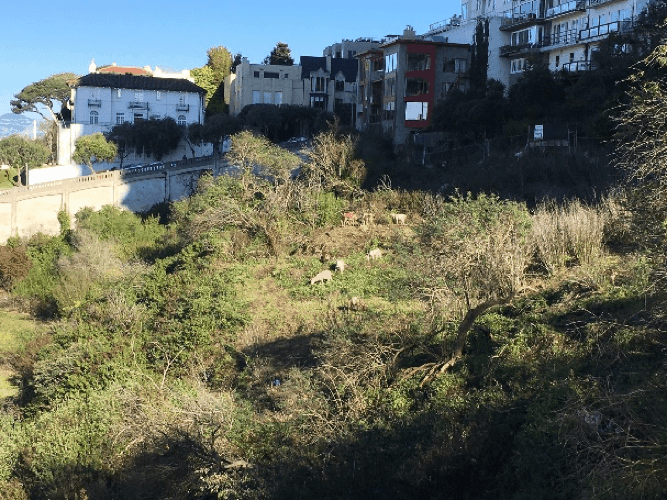 In early March, we welcomed goats from City Grazing, a San Francisco-based goat landscaping company, to help graze the land and keep the vegetation healthy. For more information, visit www.citygrazing.com. For more information on the Francisco Park project, please visit: www.FranciscoPark.org. If you have questions or comments please send an email to: info@franciscopark.org or SF Recreation and Parks Project Manager Anne Baskerville, anne.baskerville@sfgov.com.